Grout is the material that is laid out between tiles, in order to fill the spaces between and also hold the tiles firmly in place. 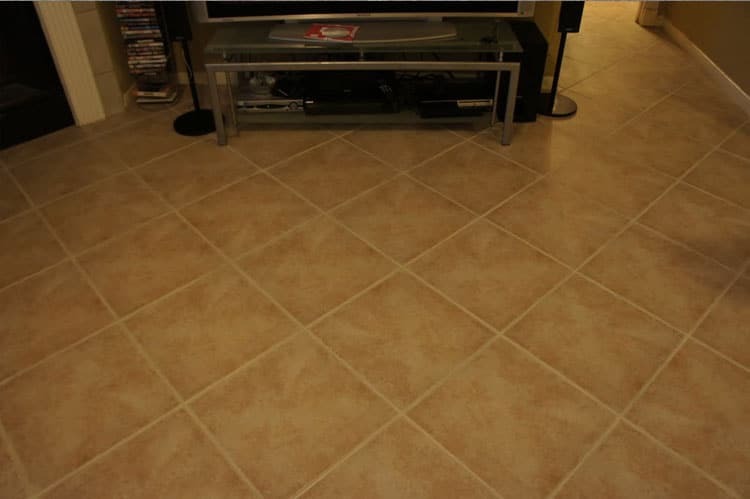 It is an indention between tiles, making the floor have deep grooves between each tile in every direction. This make dirt, debris, and build up collect in these areas whenever you try to clean your tile floors with a broom, mop, or other surface cleaner. In addition to being a deep groove, it is easier for grime to get stuck in the grout because it is a porous material that takes on stains and holds on to dirt.Whenever a liquid, such as dark sodas, red wine, or juices is spilled on grout is especially susceptible to staining. Discolored grout between your tiles will stand out like a sore thumb and will diminish the overall appearance of your otherwise beautiful tile. Surprisingly, it is not just dirt and grime from daily wear and tear, or stains from spills that cause your grout to look dingy and old. One of the most common sources for staining comes from when you mop your tile floors. Wild, right? The reason is because when you mop your floors you are spreading around dirty water, which seeps into the lowest part of the floors, the grout. Unlike with your tile, you cannot just keep going over the water picking it up and depositing it into your mop bucket. The liquid dirt is harsh and settles directly into your grout. It is important to remember, not only is dirty grout unsightly, it also carries with it bacteria, mold and mildew. This is why Modern Stone Care has made it a priority to supply the highest quality professional tile and grout deep cleaning services. We want your investment in your floors, to stay as beautiful and pristine as possible for years and years to come. We have the knowledge and tools to restore your grout to a beautiful look that will make your floors stand out, in the right way!